If you follow this blog, then you know that we’ve all been anxiously awaiting one of our members newest story – Bleeding Ice – to become available. Finally! After hearing her readings in our writers group circle; after editing discussions (uh, do you think that sentence needs a comma? 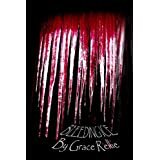 ); after rewrites and – most enjoyably – sharing the excitement of the FABULOUS book cover she created… Grace Rellie’s e-book is finally available for all to enjoy. Yes – she made that incredible cover herself. Grace is not just a wonderful crafter of stories, she’s also a talented photographer and cover artist. (By the way, I should know. She made the cover for my e-book, and it was fabulous as well). Bleeding Ice is masterfully told. It’s engaging, funny, and drags you in so deep you find yourself wishing for the next in the series as soon as you finish the last paragraph. At least, we HOPE this is the start of a new series. (Big hint to you, Grace!). Florence gets mad at this turn of events, and decides the clueless detective assigned to her case needs all the help he can get to bring her murderer to justice – her help – she determines. So Florence becomes an otherworldly sidekick to the unaware detective. Does she succeed? Well, of course she does! And without giving too much away I will tell you that there is a most imaginative section where Florence enlists help of the “already dead” variety. Grace Rellie’s characters are all good but the main character is a true delight. She’s smart, funny, and I for one want to see more of her in the future. To put it in terms my mother used to use… Flo has moxie! For those of you that don’t already know this, Grace Rellie is the pen-name of Elizabeth Rye. Grace (Elizabeth) writes about disasters – real disasters – that have molded and shaped the way we do business and the laws we live by. She does extensive research and is currently close to completing a non-fiction book on this subject. When she’s not researching or writing about disasters, she writes stories about romance, mystery, and intrigue. She is a historian and truly has an appreciation of eras gone by. Many times in her stories the past shines through and enlivens the action, as well as educating the reader. Bleeding Ice is no exception to Grace’s ability to catch the reader’s attention right from the get-go, and hold that suspense right up until the very end. If you think you can handle Flo’s moxie, and are looking for a thoroughly enjoyable read, please visit your favorite book retailer, and download a copy of this entertaining short story. Please, be sure to come back to our blog after you read Bleeding Ice and let us know how we’re doing. Our writers are here to serve you, delivering some of the best fiction, children’s stories, and non-fiction you will find on the web. Link | This entry was posted in Happenings, Uncategorized and tagged bleeding ice, detective, Elizabeth Rye, Grace Rellie, humor, murder, short story. Bookmark the permalink.